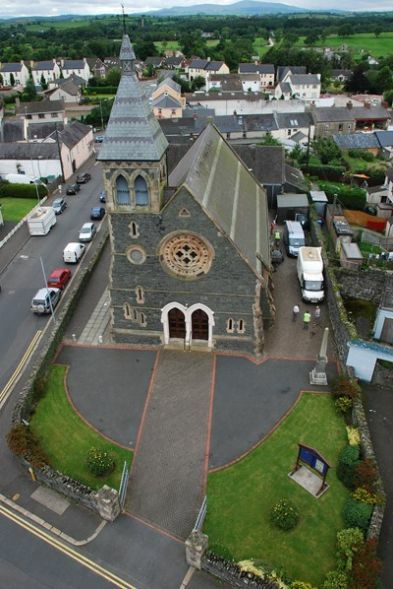 As with so many others, particularly in the Downpatrick Street and Market Street areas of Crossgar, Lissara Presbyterian Church will remember Thursday 3 July 2008 for a long time. Those in the vicinity described the noise as something “like a bomb going off” and the tills in shops stopped working, phones stopped ringing and lights went out. The lightning storm caused widespread damage around many of the villages in County Down with complete housing estates losing either electricity, phone service or both. As most of the organisations associated with Lissara had brought the season's activities to an end the damage was not noticed until Saturday morning when one of the church committee was preparing the flowers for Sunday morning. The initial report was that the church had been burgled, light-switches damaged, light-bulbs broken and the place in a bit of a mess. On further inspection it did indeed look like a burglary and then the lack of power was noticed and a lighting strike was suspected. An electrician was called and discovered that the earth leakage trip had been almost blown off the wall, all the 100 amp fuses on the three phase supply had been blown, the light switches that had been blown off the wall were burnt around the contacts and the electrician could not safely restore the power supply without a full survey. On the first Sunday the service was (in the words of the “Old Grey Whistle-Test) “unplugged” although as the weeks progressed the electrician organised a safe temporary power supply that allowed some semblance of normality. The July holidays slowed the process, insurance company appointed a loss-adjuster, the loss adjuster appointed consultants, consultants reported back and it transpired that the electrical supply to the complete suite of buildings had been so badly damaged that a complete rewire was required. The church committee decided that the priority was the reinstatement of the hall that was required to allow the organisations to recommence in September. However, as nothing is simple, the rewiring of the hall caused sufficient damage to the decoration that it was also decided that a complete redecoration was required before the job was completed. The decision was also taken to upgrade other facilities in the buildings and even with all this work there is still every effort being made to ensure that the organisations can start on or near their normal dates. Once this first phase of the work is completed all activities including Sunday worship will be moved into the hall and the rewiring of the church will commence. This becomes an even larger task when the height of the building is considered. Health & Safety regulations require that the whole building is scaffolded and, in turn, this means that the tops of all the pews have to be sheeted with plywood. The plans are to have all the repairs completed by October/November and as part of the repairs the church committee are also looking at upgrading some of the audio visual equipment in both the church and the hall.